Swimming: the second most popular physical activity in the UK, with 14% hitting the pool on a regular basis, according to Sam Murphy of The Guardian. There is no doubt a frequent swim has obvious health advantages; you exercise your whole body, it increases energy levels and it improves your strength, flexibility and balance. Swimming at a moderate pace burns around 800 calories an hour, it’s beneficial for those with joint and muscular problems, and the simple act of gliding gracefully in the water relieves your mind of stress, as Swimming Information tell us. It’s also a lot of fun; who hasn’t imagined they were a mermaid whilst swimming underwater or splashed around in the pool with your friends on holiday? And accomplishing your goals can be very rewarding. I recently returned to swimming after a long break when I decided to swim a mile for charity. I would train 3 times a week, and after each session I would feel invigorated, refreshed, and a lot fitter. Even after completing the mile, I try to swim at least once a week for my fitness fix – I gained a lot more than a medal! Whether you want to start out this great activity, swim for your health or to just improve your technique, read on for some great advice from some professional swimmers and coaches. When and how should I train? Dan Bullock, director of SwimforTri, an organization that offers swim coaching, suggests swimming as often as you can if you want to make real improvements. He says “It’s better to hit the pool three or four times a week for 20-30 minutes than to go for one or two longer sessions”. In terms of nutrition, make sure you have something to eat an hour or so before you swim, keeping the amount fairly light. You probably don’t realize it but as with any other exercise you are bound to sweat, so have a drink at the pool side to keep you hydrated. Afterwards, have a healthy snack like some fruit or a cereal bar to stop you snacking on sugary foods. When you’re at the pool, mix up your strokes so you don’t get bored – when I go swimming I start off with breast stroke and challenge myself with a length or two of freestyle and go back to breaststroke. Combining this with drilling is an excellent way to build on your technique. This is when you concentrate on a certain technique e.g. legs only with a float – see Ruben Guzman’s The Swimming Drill Book for more information on this. A study by the U.S government, found that shockingly, 98% of recreational swimmers don’t make gains in aerobic fitness due to poor technique. Having an efficient swimming technique is therefore of utmost importance if you wish to reap the benefits, and it will make it far more enjoyable and worthwhile. Breaststroke is the main culprit of sloppy swimming. Steven Shaw, creator of the Shaw method of swimming and author of Master the Art of Swimming uses the mantra “easy, work, enjoy” to break the stroke into its different components. ‘Easy’ is coming out of the glide, pulling with the arms and inhaling, ‘work’ is thrusting your legs back as you exhale and ‘enjoy’ is the glide. Shaw says that the more powerful your leg kick, the further you’ll glide. Don’t rush into the next stroke – only when you begin to feel yourself slow down should you take the next arm pull. Try not to work the arms too hard, Shaw says it’s actually the legs that drive the stroke, with 70-80% of the power coming from the rear; this is why it is so important to nail the leg technique. Karen Pickering, a former world champion swimmer suggests that a frequent mistake with the leg kick is not finishing off properly – a lot of swimmers don’t bring their legs together in a streamlined position at the end of the kick. She says “Think of driving the legs out and back together as one fluid motion”. Have you ever swum behind someone whose legs were doing completely different things? This is another common error, known as the ‘screwkick’. Steven Shaw says you should try and keep the legs and feet symmetrical – if one foot is turned out and the other isn’t, it can cause the back to twist. You can remedy this with a drill by swimming on your back and practicing your breaststroke kick as this will enable you to observe your leg action and tweak any asymmetry. Freestyle: Breathe into the water pocket! Swimming is an excellent cardiovascular sport, it works our heart and lungs better than any other exercise. As we can’t breathe under water, it is essential to learn to control our breathing. This is especially true for freestyle, as bad breathing technique can easily affect the stroke technique. Exhaling is just as important is inhaling. According to Swimsmooth fully exhaling under the water between breaths means you only have to inhale when your head is out of the water, saving time and effort. It also relaxes you and helps with bilateral breathing; try and aim for two strokes underwater and turn your head on the third, enabling you to breathe on both sides. 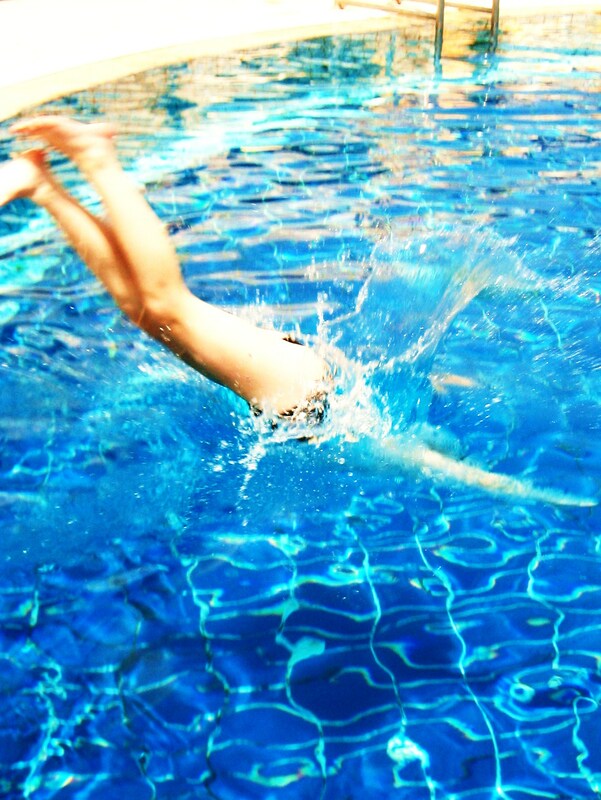 When you’re not breathing, keep your head still by concentrating on one point at the bottom of the pool. You want to be as close to the surface and as streamlined as possible, but lifting or over-rotating your head to breathe can affect your body position and balance. When you swim you create a bow wave which drops at the side of your face, creating a dip in the water. You only need to rotate your head a little in order to breathe into this ‘water pocket’. This will avoid straining your neck and help maintain your position. Good body rotation is also very helpful for your breathing, because once you have rolled your body to the side, you don’t have to turn your head much further to breathe. Terry Laughlin author of Total Immersion: The Revolutionary Way to Swim Better, Faster and Easier talks about swimming mindfully. Learning to control your body in the water is one thing, but controlling or mind is another story. When Laughlin decided he needed to give his technique a makeover, he found that he needed to learn a new way of thinking before he could learn a new way to swim. He says it is important to ‘hold one thought’ by focusing on and visualizing the technique you are trying to master as you swim, and dismissing all other thoughts. Concentrate on the challenge of developing your technique and think about the potential for vast improvement in your swimming, and this will motivate you to succeed. With London 2012 just around the corner, why not get into the Olympic spirit by getting back into swimming. Bring a friend along and you can encourage and push each to reach your goals – and have a chin wag along the way!